This is an odd little movie. It kind of fits in the rom-com category. It's kind of funny. It's kind of just plain wacky. The wonderfully lovely Aubry Plaza (from Parks and Recreation) plays an intern at a Seattle magazine who gets the chance to help cover a story about a loner who places an ad in a newspaper seeking someone to travel back in time with him. 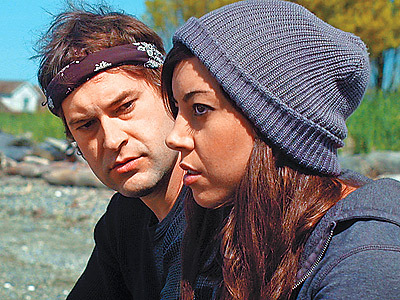 Safety Not Guaranteed is a minor, indie take on Back to the Future. Mark Duplass, my favorite character in the excellent show The League, plays the time traveler. The best elements of the film include: the viewer's ability to begin loving Duplass and Plaza quite a bit in due time, some of the hysterical comedic bits like when Plaza's fellow intern nerd dons sunglasses in order to strengthen his cool factor and have a shot at getting laid, and the "terrible" song Duplass plays for Plaza one night at a campfire. This may not seem like a must-see movie, but anyone who doesn't like sci-fi and thinks they wouldn't like the time-travel element should not shy away. The true focus here is relationships, and that's a winning formula whenever you bring in actors this good.